hertalan easy weld is an EPDM roofing system which is suitable for all types of roofs: loose laid with ballast, fully or partially adhered and mechanically fixed. 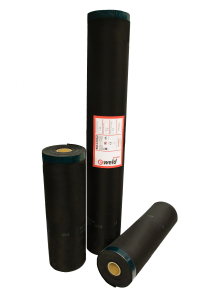 Standard roll MF for mechanical fixing, with TPE weldable edge top, edge one side bottom edge other side. / Especially for mechanically fixed systems. / Roll length 20 mtr. and widths of 700 and 1400 mm. / Available in thicknesses from 1.30 and 1.50 mm. Standard roll , with TPE weldable edge top edge one side bottom edge other side. / Roll length 20 mtr. and width of 1400 mm.